A report issued by the World Bank/IMF last year on the outlook for 2015, cited the US Federal Reserve as the single biggest risk to world economic growth. This means that if the Fed raises rates too much and/or too soon, it threatens world growth. Capital flight out of emerging markets and economies is either slow paced in 2015, allowing local adjustments, or a rushing out that causes collapse. The extent of dollar denominated and local currency borrowing by emerging economies over the past ten years has created vulnerability. Following in the Fed’s footsteps, central banks in Japan and Europe are doing what they can to hold their entire yield curves down to keep borrowing costs stimulative to their economies. A significant increase in US rates threatens to undermine these efforts by attracting capital away. Like never before in its history, the Fed is aware of the influence it has this year over non-US economies and world market volatility. The Goldilocks (not too cold or too hot) recovery and lower oil prices should give it plenty of cover to drag its heels. With that as a backdrop, how do we interpret this month’s valuation return opportunities? Ultra-loose world central bank monetary policies continue to benefit all risky assets – despite the overvaluation of some. Looser for longer policies in Japan and Europe relative to the US favors undervalued equity markets there against overvalued US equities. Neutrally valued emerging market equities, and particularly undervalued Brazil and Russia are increasingly vulnerable to rapid capital outflows from an overly aggressive Fed. 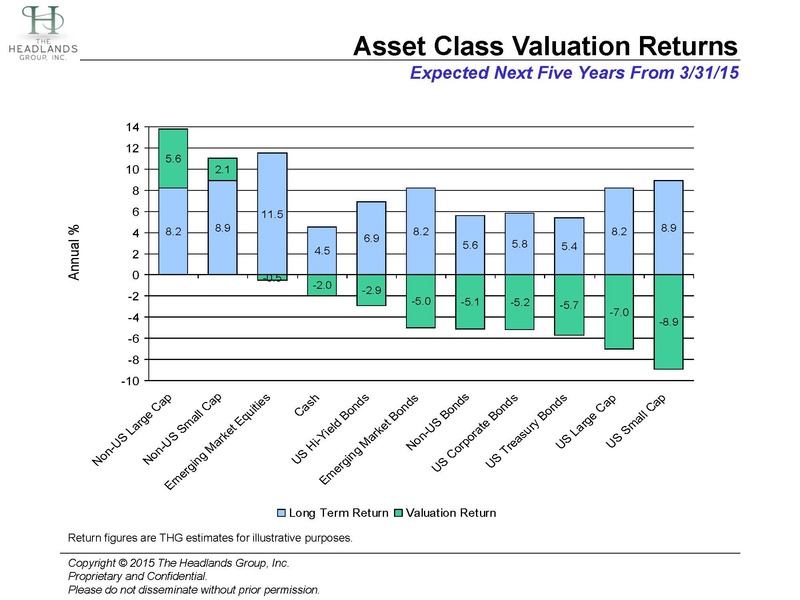 Thus attractive valuations are likely to get more so before paying off early and brave new investors. What about bonds? Emerging market bonds are most vulnerable despite spreads recently widening. An aggressive rate rise pushes up overall rates and increases capital outflows, causing spreads to widen – a double hit. An aggressive Fed in response to strengthening growth supports US credit spreads: investment grade and high yield relative to Treasuries. Short durations everywhere are safest, given record low yields.